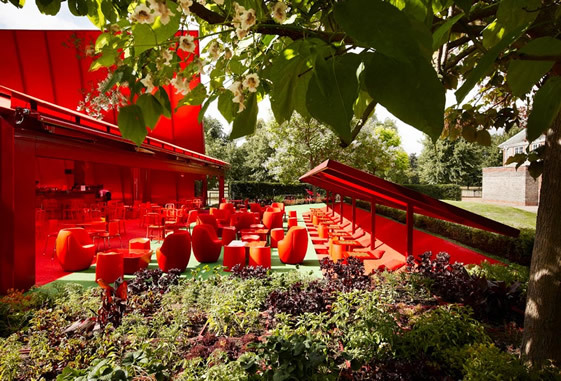 This year’s Serpentine Pavilion is… red. Red indeed. Reminded me of our Peru dining tent, heh. Its colour makes it loud and its loudness makes for an interesting structure in the park precisely because it stands out so much. It has some really amazing features – big panes of red glass, a towering structure as well as it stretching and spanning out across a huge area. I’m not sure what the thematic criteria are for the Serpentine Pavilion (a competition is held annually as architects from around the world are invited to submit their designs), but I’m guessing that creating a social space must be a central one, considering it’s a structure within Hyde Park – a green space for city dwellers to come together to sit and eat, hang and relax. And if that were a requirement, this year’s pavilion is indeed successful. Some really nice furniture – beautiful Emeco chairs, built-in chess tables (you have to bring your own chess sets? ), hammocks and bean-bags. Also red ping-pong tables! However, while I appreciate the social aims – it’s really disappointing that the snack bar sits right smack in the middle of it. It seems such a shame. I can’t help but think… maybe the Serpentine makers thought – ooh let’s see which design gets the most people in, remain in and to spend money. I’d like to think not though! I loved the one from three years ago. An architectural feat and also a clever but more subtle social space. 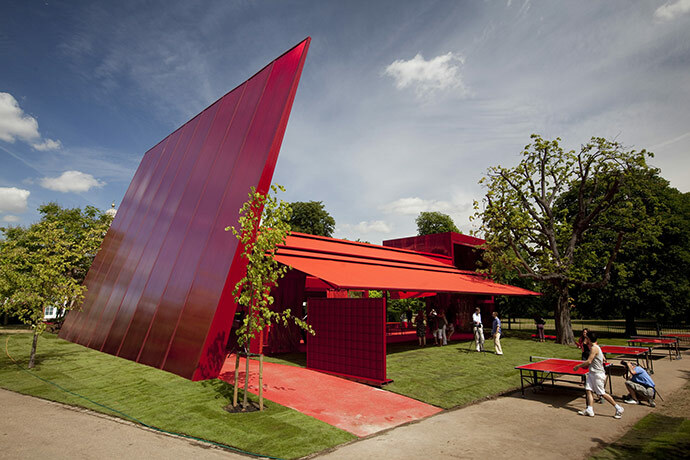 But nonetheless this year’s pavilion is impressive and cool (or red hot :D).